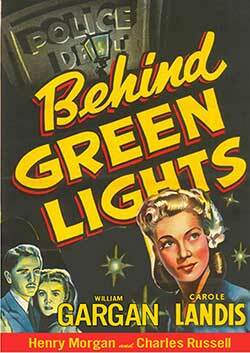 Behind Green Lights takes place entirely during a single night in a mid-western city. A car rolls up to the green globes of a police station and dumps the murdered body of a private investigator who dabbled in blackmail. Brought in for questioning is Carole Landis, daughter of a mayoral candidate, who had been in the extortionist’s apartment earlier that evening. Police lieutenant Sam Carson investigates a political murder. His conclusions could swing the election that’s just a few days off! Starring: Carole Landis, William Gargan, Richard Crane. 1939 – BW – 64 Minutes.